Sigma was first and their idea was a great one. Create a USB dock that allows a lens to be easily connected to and updated by a computer. I asked the "Why hasn't someone delivered this product before?" question when the Sigma USB Dock was first delivered and it is great to see another lens manufacturer taking advantage if the idea. 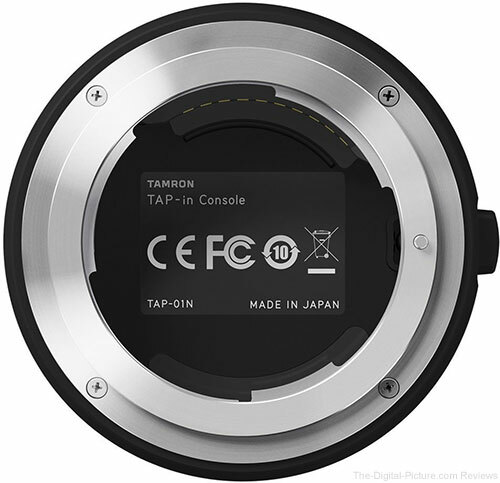 Basically, the Tamron TAP-in Console USB lens mount and its accompanying TAP-in Utility software allow a computer to control the settings and programming, including firmware, of compatible Tamron lenses. The TAP-in Console has a rounded puck shape measuring 2.8" (72mm) wide and 1.0" (25mm) thick with a metal lens mount for attachment to a lens. Opposite the lens mount is the mostly non-descript top featuring an LED status indicator and a USB port on the side. The console's finish has a grippy, slightly-rubberized feel to it. Once the lens is attached to the TAP-in and the TAP-in is attached to a computer via a USB cable (provided), the TAP-in Utility software app communicates with the lens and automatically checks for available firmware updates. If an update is available, a dialog box is presented, providing the option to update the lens. 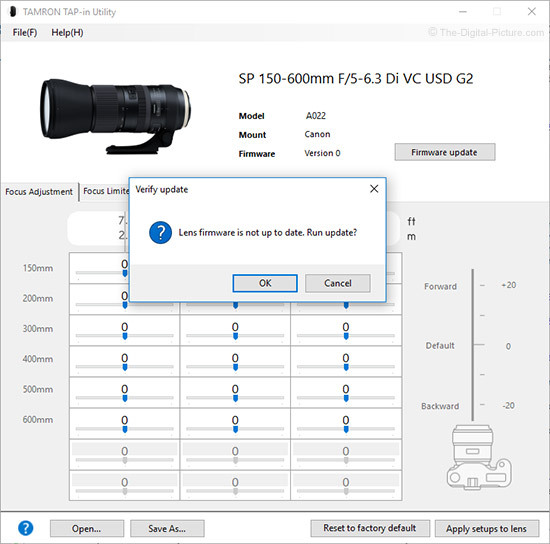 There have been a number of Tamron lens firmware updates released recently, addressing compatibility and other issues and having the TAP-in Console allows those updates to be made quickly and easy, especially compared to shipping the lens to a service center. 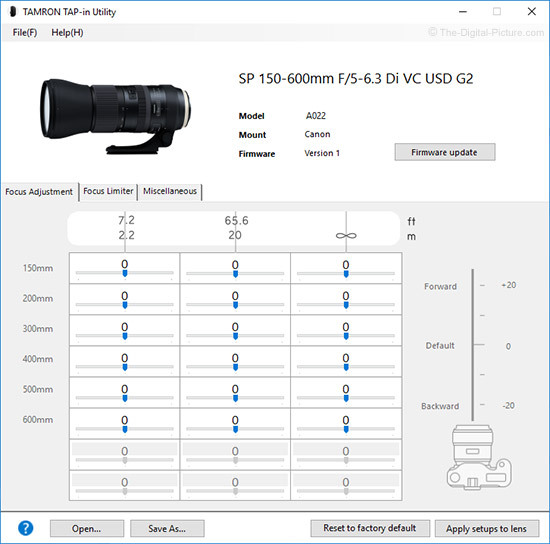 Having a camera and lens out of focus calibration, exhibiting consistent front or back-focusing, is not uncommon and that issue is another great reason to get the TAP-in Console. 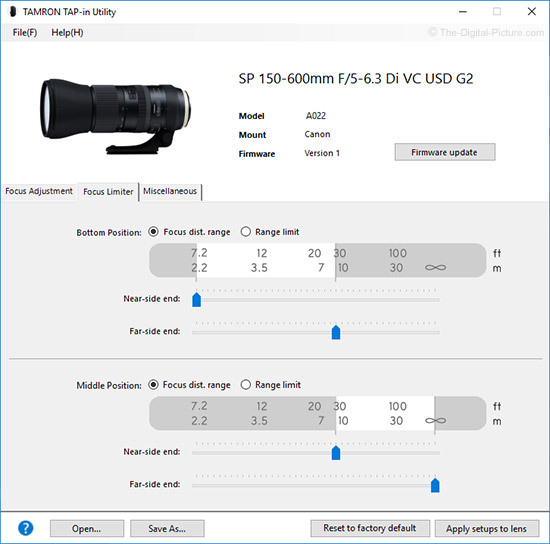 Via the TAP-in Utility's Focus Adjustment tab, AF adjustments are available for multiple focus distances and at multiple focal lengths for zoom lenses. With the Tamron 150-600mm f/5-6.3 Di VC G2 Lens, for example, AF adjustments can be made at 6 different focal lengths. With 3 focus distance adjustments available at each focal length, there are a somewhat-daunting 18 total adjustments available for this lens, ready to drive perfectionists crazy. Note that I simply made up the adjustment numbers in the example shown above. Also note that any camera-related issues will not be addressed by the USB console, meaning that a lens can be dialed in for one camera, but if two cameras are not performing identically, an in-camera adjustment will be required in one of them. One more note is that, while the TAP-in is excellent at correcting calibration issues, it cannot address any consistency issues present. When supported by a focus limiter switch on the lens, the software's Focus Limiter tab provides the ability to customize the autofocus distance range selected by the non-full focus limit switch settings (typically one or two of the two or three switch positions). The last tab, Miscellaneous, provides control over the full time manual focus override feature and allows customization of the VC mode. 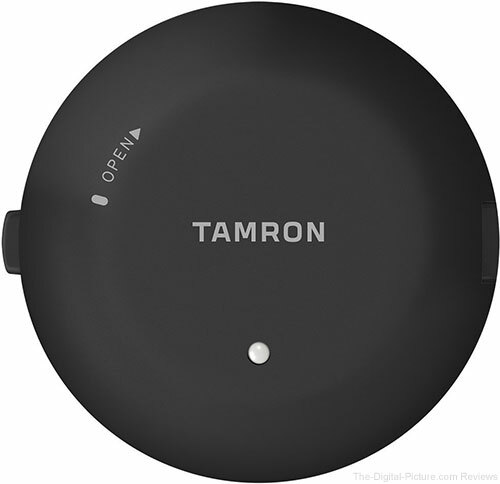 The Tamron TAP-in Console version is camera mount-specific and available in Canon, Nikon and Sony versions at review time and it comes with a 6 year warranty. 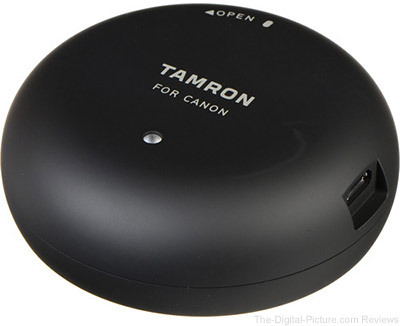 And as of review time, the Tamron TAP-in is priced identically to the Sigma USB Dock. While that price seems somewhat high, it wouldn't take many uses of this device to become worth the cost. As this device will likely be needed only infrequently, it seems that friends, photography clubs and other regional groups purchasing a shared TAP-in makes a lot of sense. Although not inexpensive, the Tamron TAP-in Console is a great product that can make life better for photographers depending on compatible Tamron lenses.